I have 4 boys who have all gone through various stages of refusing eat anything healthy. All of them ate whatever I set before them until just before they turned 2 when all of a sudden either their tastes buds changed or they figured out they can say no. From 2 until about 8 it seems like it’s a constant struggle to get them to eat the food I prepare for them and I’m a darn good cook! Here are a few tricks I’ve learned over the years on getting my kids to eat. If you have any of your own, please comment! We can all learn from each other’s experiences. Do you want carrot sticks for your veggie, green beans or peas? I might get some groans from the choices but they make their choice and eat it. If I just put what I thought they might want on their plate, it’s a fight to get it to their mouths. I let the boys pick a night of the week where they are in charge of dinner. They pick out the main dish and veggies and help me prepare it. They hate liver. Hate. Liver. It’s hard to believe they are my children. When I was little, I would actually order it at a restaurant if they had it on the menu. Yeah, I’m a freak. But I have awesome iron levels! So I sneak it in hamburgers, meatloaf and meatballs. Just a little. Too much and they are on to me. I keep hoping to up the amount a little at a time but each time I put in more, they figure it out. Vegetables are easy to hide in pasta sauce like my Sneaky Spaghetti Sauce. Salmon cakes aren’t just made out of salmon. They have pureed carrots, onions and celery. Process them into a paste before adding to the salmon and they’ll never know! #4 Appeal to their competitive spirit. Who can finish their veggies the fastest without choking! At least for my boys, this works. I love this method. The first time I tried getting them to take cod liver oil, I told them how absolutely disgusting it was. Horrible! Kids would hide under their bed trying to get out of taking it. I double dog dare you to try it. I bet your brother will. Not so bad? I guess I was wrong. #6 Don’t underestimate their intelligence. Educate them so they understand why eating the way we do is worth it. Let them watch Food Inc and Sugar: The Bitter Truth (Short version). You might be surprised. Our goal after all is for them to continue making good nutrition choices throughout their life. 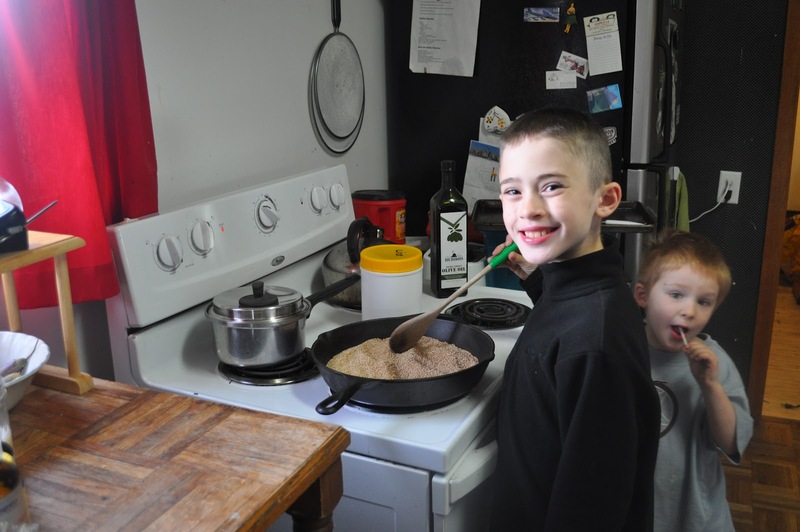 We homeschool and part of our curriculum is Food Renegade’s Real Food Nutrition for Kids. Even if you don’t homeschool, you can still teach your kids about nutrition. # 7 Reward Good Choices. We don’t normally do dessert but I do like to have some reward for finishing their meal. I’ve never cared for the idea of making kids lick their plates clean but I do want them to have a well rounded meal. Their first plate of food is very sparse. Just a spoonful of everything served. If they are still hungry, they can always have seconds or thirds but they are to at least eat everything on their first plate. So for a reward I’ll let them have a snack while we watch a movie, like popcorn, dates or cereal and occasionally ice cream. But only if they ate their dinner. With an extra picky eater, we trade off bites. One bite of yucky and then one bit of tasty. #8 Practice what you preach. Don’t expect them to give up all their Halloween candy if they know you’re just going to eat it for them after they go to bed. Don’t tell them they can’t have a soda while you indulge in one yourself. Actions speak so much louder than words. #9 Train their taste buds the right way. I don’t allow babies to eat sugar or any junk food at all. I even serve them yogurt unsweetened (which they all have gobbled up by the way). Don’t let them get used to over sweetened, highly processed foods. I wish I could hide sweets and junk food from them forever but eventually they get a taste when they are out of my control. I always offer a wide variety of fruits, vegetables and nuts. Instead of a box of crackers for a snack, they can choose an apple, nuts, yogurt or a tall glass of whole fat milk. Fantastic!!! I love how simple you made it!For my more long-winded approach, check out the series I've started: Empowering Kids on Special Diets.The other day I asked my former picky eater if she'd rebel as an adult by eating frozen dinners and fast food. She was appalled and disgusted! Thanks for the encouragement and the hope. You think the pickiness ends around 8, huh? My six year old is getting pickier by the day and driving me crazy. I had almost lost hope that he would ever eat anything without me practically shoving it down his throat.